The Bobwhite Quail or Northern Bobwhite is basically a game bird that is mostly found in the eastern regions of North America. These ground dwelling birds are also native to Mexico and the Caribbean. How to attract Northern Bobwhites? Bobwhites can easily identified by their plump round body that a close resemblance to a chicken. The bird earns its name from the famous, loud call produced by the males. There are a total of 22 known subspecies of the Northern Bobwhite. These birds prefer habitats that chiefly include grasslands, pastures, abandoned fields, crop fields and wood edges. Bobwhite Quails have sufficed a profitable business for many commercial farms around the globe that raise thousands of these birds every year. This bird belongs to the group of species called New World Quails. The other popular names of this bird also include Virginia Quail. Size: The bird measures about 8-11 inches in length. It has a round body with a wingspan of approximately 15 inches. Bill: The bill is brownish black in color. It is also short and curved. Color: The body has a combination of brown and white colors. The males have a black and white face. The color of the faces of the females is buff color mixed with white. Both the males and females have pale looking legs and feet. Markings: There is white colored stripe right above the bird’s eye. It also has a whitish patch on its throat. 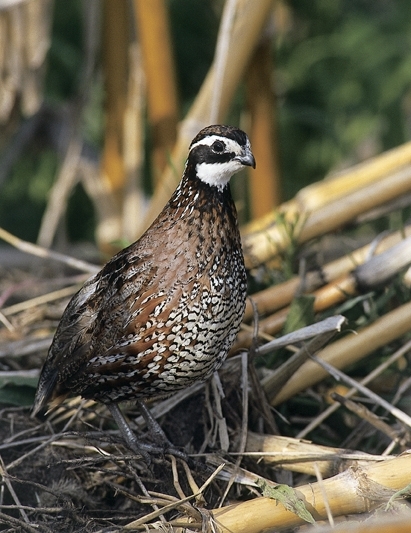 The Northern Bobwhite feeds on seeds, vegetation and insects. It is usually the diet of the young juvenile quails that majorly comprises of insects, bugs and animal matter. However the adult quails will prefer to stick to a diet comprising mostly of vegetation. The bobwhite quail loves eating foxtail and ragweed seeds during the fall and winter months. It does not refrain from feeding on waste grains as well that are usually found in cultivated fields. Apart from all this its diet could also include hackberries, blackberries, huckleberries and other wild fruits. The northern bobwhite is sub divided into 22 different sub species. Let us take a closer look at a few of the other species. Eastern Bobwhite: This particular sub species of the bird is the most familiar ones that are generally kept by people. They are found in a variety of habitats including open woodlands, parks and crop fields. 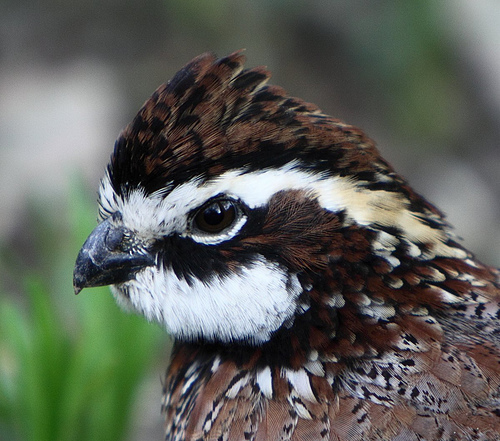 Masked Bobwhite: This particular kind of bobwhites is mostly found in the southwest. They bear a close resemblance to the eastern bobwhites. However the males have a comparatively darker face and throat. In fact the entire tone of the body of masked bobwhites is darker than their other sub species. These birds prefer to reside in open pastures, grasslands, abandoned fields, wide woodland areas, forest edges and agricultural crop fields. Sometimes they are even spotted on roadsides. The southeastern regions of United States are home to the bobwhite quails. These birds can be found in the areas of the Great Lakes, southern Minnesota, east Pennsylvania, southern Massachusetts, Nebraska, Oklahoma, Kansas up till Texas. They are familiar to regions in eastern Mexico and Cuba. The states of Oregon and Washington are also frequented by these birds. However these birds have been observed to have disappeared from the southernmost parts of Florida and the summits of Appalachian Mountains. Enlisted below are some interesting facts about these game birds. There are a total of 22 different subspecies of the Northern Bobwhites. A significant variation exists between the males of the different subspecies. However there is little variation among the females of the different forms. These birds are known for their calls. There are almost 19 distinct calls that are produced by this bird. Females can lay more than 20 eggs at a time. Both the males and females are involved in the process of incubating the eggs. The meat of these game birds has become a popular alternative to chicken meat in many parts of the world, especially in the United States and UK. Breeding bobwhite quails has lately become a profitable business. The male bobwhite quails attract the females by their singing, right from early spring. These birds are generally categorized as monogamous birds that have only one mate. However there have been certain exceptions of polygamy observed among them. Mating season starts from early May and can last up till August. The nesting period drags from May throughout September. Both the males and females put a genuine effort in collecting the materials and building the nest. Females are capable of laying up to 20 eggs at a time. Once again both the male and females will be involved in incubating the eggs. The incubation period can last about 23-24 days after which the eggs begin to hatch. The young birds are fed and cared by both the parents for a period of almost two weeks, until they are ready to fly. 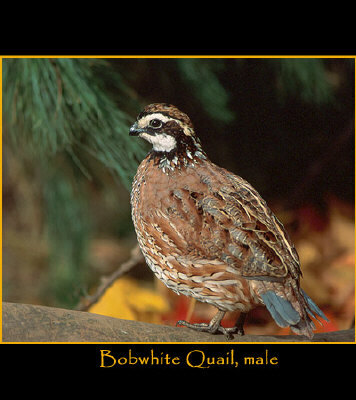 Bobwhite quail is a game bird that is generally hunted for food or sports. These birds are observed to be shy like most game birds. At the same time they are also quite elusive in their behavior. On sensing a threat or danger, this bird tends to stoop and freeze thereby depending on its camouflage to stay unnoticed and untouched. This bird will try to take a low flight if acutely disturbed. Bobwhite quails are basically solitary or they are spotted in pairs. However during summers it is common to find them in family groups. A proper habitat consisting of grassland and scattered seeds or even cracked corns could entice these birds to your backyard. These birds can also be attracted by preparing bird baths that are at ground level. However it is recommended to refrain from using insecticide sprays on the yard. Low shrubs should be used for the purpose of landscaping in order to make these game birds feel secure. While raising these game birds, it is very important to remember that a poor quality feed could have adverse effects on especially the young chicks. Quail barns and flight pens are the two chief and basic production requirements necessary for producing Bobwhite quails. Breeders are either housed in pairs/ trios, small cages designed to fit up to 10-20 birds or huge community floor pens. These birds have a tendency to survive and adapt really well to a captive environment. Great management skills, right pairing and proper environment as well as diet are the key factors to be kept in mind while raising bobwhite quails. The flavorsome meat of the bob white made it a regular alternative to chicken for many people around the world. Baby bobwhite quails and also the eggs are sold in many parts of UK and the United States. 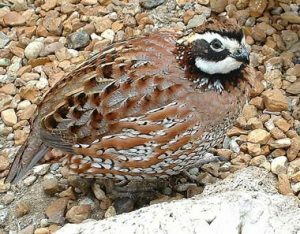 One of the subspecies namely the Masked Bobwhite Quails has been listed under endangered species. The widespread popularity of cattle ranching in areas like Mexico is said to be the cause that led to destruction of quality habitat of these birds. Are you curious to know how the bird looks like? Check out some of the images of Bob White Quail.